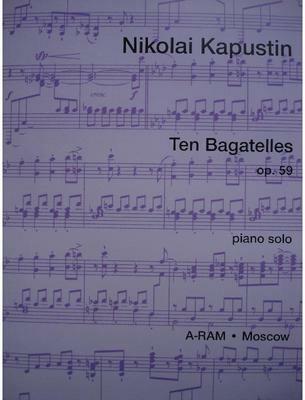 Kapustin has many sides to his musical personality, and the Ten Bagatelles op. 59 demonstrate how well he can write unpretentious, light-hearted piano pieces whilst at the same time involving the performer and listener in some fascinating musical diversions. Written in 1991, the work comprises a series of witty, essentially theatrical compositions that may remind you of Sondheim or Gershwin; indeed, each of them could be thought of as a short overture or interlude to an imaginary musical. What do you want to know about 10 Bagatelles op 59 by Nikolai Kapustin?